Old habits die hard. From the years 2001 to 2010 there were only two short summers in my life that I didn’t need to save quarters in order to do laundry. The rest of the time, if I didn’t have a healthy supply of quarters on hand, I didn’t have clean clothes. Quarters were like gold to me for almost a decade, and even though I don’t have a reason to save them now, I still subconsciously hoard them like the pack rat that I’m not. Normally all this does is weigh down my wallet, but last month in San Francisco, it turned out to be a really good thing. Andy and I were doing the typical San Francisco touristy thing for my birthday – we toured Alcatraz, hiked up the curves of Lombard Street and enjoyed over-priced clam chowder bread bowls near Fisherman’s Wharf. But, before we paid too much for clam chowder, we found something unheard of – something that still only cost a quarter! Which was awesome, because I happen to have had a few. While enjoying the sunny February day (I’m telling you, sun is the way to go when you travel) we’d walked out Pier 45 to get a better look at the fog-free bay and that’s when we saw it – Musée Mécanique. We’d stumbled upon it from a side entrance with no visible signage. It looked more like a half-opened garage door leading to some sort of enchanting, dusty flea market than what it really was… which was a place that childhood dreams are made of – or maybe nightmares, depending on your personal phobias. 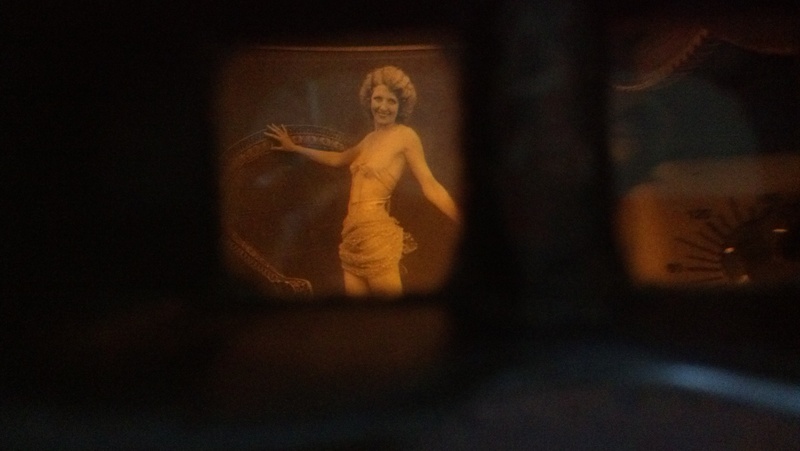 Musée Mécanique in San Francisco – lots of fun and also a bit creepy. At first, Andy and I just perused our fantastical surroundings (and also tried to figure out if we’d bypassed some admissions gate and had accidentally slipped in without paying). It was like we’d stepped into the past. The air was musty, the warehouse-like room was full of echoing old-timey sounds and the whole place was a bizarre mix of creepy and whimsical. If there was ever a place for a carnival-themed horror film, this was it… and we visited on a sunny day, I can’t even imagine what a dark, winter evening feels like here. What we’d inadvertently entered was the Musée Mécanique – a private collection of vintage and modern arcade games and the like. They have machines dating back to the 1800’s and they are all (as far as I could tell) in good, working order. It was like some funky, interactive museum. 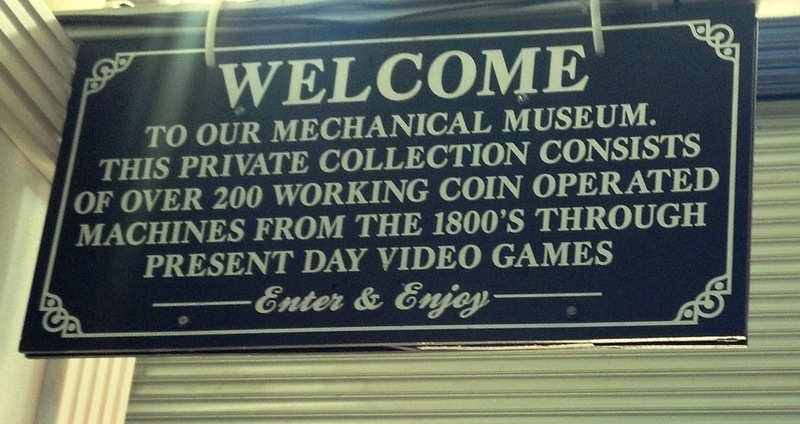 The welcome sign at Musée Mécanique – proof that there are some seriously old machines here. Like any kid who has ever begged a parent for change at an arcade or in front of a grocery store plastic pony ride that jerks forward and back for a whopping 30 seconds, I immediately wanted to play! As I examined some of the more intriguing machines I noted their 25¢ posted prices and I could hardly contain my excitement. Could I play? I guess so, I mean, my mom and dad were nowhere in sight to tell me that I couldn’t and after all, I’m in charge of my own quarters now. I quickly took stock of my change and was delighted to find no fewer than 13 quarters in my wallet – which I divvied up between Andy and me. Let the fun begin! Some of the machines were creepy. Some were life-sized and creepy. Some were a little dark. And others promised to be inappropriate for children but really were not so bad. This slide show promised to be lewd… I found the girls and their outfits charming. Which I suppose is just another sign of the times and a prime example of how we are all morally corrupt. Where: Pier 45 at the end of Taylor Street in San Francisco. Cost: Free admission (as it turned out, we weren’t criminals). Machines and games range from 1¢ to $1 with most games costing 25¢ to 50¢. Also, they have change machines. Why: To have fun and pretend you’re in some old-fashioned horror film where nothing bad has happened yet – but just might at any second. Will those creepy machines come to life? Is some heinous serial killer hiding in that Laffing Sal costume? Who knows. Other good things to know: This would make a great rainy-day activity for families. With just two adults, Andy and I spent probably an hour here. Also, teenagers who might not really be into the charm of the vintage arcade games can play modern games like air hockey and stuff like that. When we finally left we exited through the main entrance and saw the sign. I’m not going to lie; it was a little more mysterious to enter through the side door like we did. 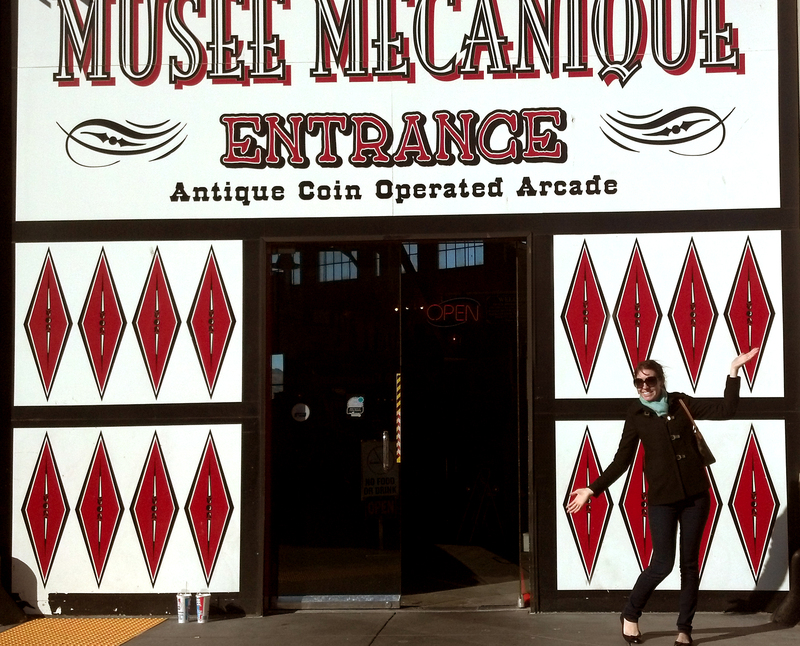 Overall the whole trip to San Francisco was a treat and our stumbling upon the Musée Mécanique made it a little better. If you should find yourself down by Fisherman’s Wharf I would definitely recommend you stop in and at the very least, check out Laffing Sal – unless you need quarters for laundry, in which case, avoid this place at all costs! That is awesome! Another reason to visit San Francisco! How do you divide 13 quarters between two people? Well, they were my quarters so naturally I got one more than he did.